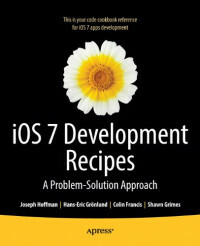 iOS 7 Development Recipes: A Problem-Solution Approach is your code reference and guide to developing solutions on the iPad, iPhone, and other iOS 7 SDK devices and platforms. This book provides in-depth code samples and discussions for scenarios that developers face every day. You'll find numerous examples of real-world cases that will enable you to build fully functional applications quickly and efficiently. You'll find this book to be an indispensable reference for all your iOS development. This book is intended for developers familiar with the Objective-C programming language and with an interest in developing apps for the iPhone and iPad. While a basic knowledge of Objective-C is expected, developers at all levels of app development will benefit from this book.